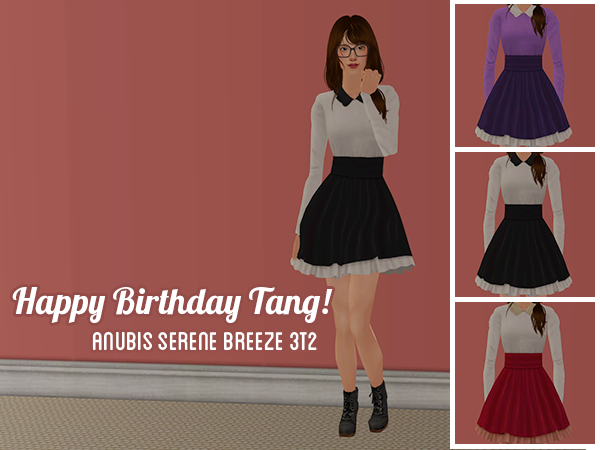 When I saw this dress on Anubis’ blog, I had to think of you and how it’s totally your style of CC XD So I made it for you. It’s Anubis’ Serene Breeze dress for AF, 3t2, with Sentate’s emma boots. The mesh has a fat and a pregmorph. The dress comes in the three colors you can see in the preview picture. The files are clearly named, so you can easily chuck unwanted dresses. I can never thank you enough for this, seriously, I loved it! And, can I say that choosing Emma Boots was the cherry on top? I meant, you must be some kind of wizard, you even knew my favorite shoes! I love you! And again, I can never thank you enough.